It seems like this week just flew by. As usual, I've been feeling pretty tired due to the pregnancy, so I didn't get around to taking pictures of this card until today. This is a card I've been working on for a while. It's for the June OCS (one card swap). Sorry the pics are a little dark. I was having trouble with my daughter's camera. Also, I have to use a different computer since my other one crashed (UGH). Sooo...I do not have access to Photoshop at the moment *BOO HOO*. Anywho, the challenge for this month's swap was to incorporate a FAVORITE. I included many of my favorites when making this card. I used blue, red, and white cs by Bazzill. It's my go-to cs and has been my fave for years. The background pp with flowers is actually the reverse side of some Snow White themed pp by Reminisce. They have the cutest, cartoonish line of fairtytale pp out now! I used Doodlebug glitter paper for the Hello Kitty Sizzlits die cut. Oh, how I *heart* Doodlebug glitter paper -- actually, ANYTHING by Doodlebug!!! I added some bling to her bow because every girl needs to have a little bit of bling, right? Also, if you know me, you know I love bling!!! 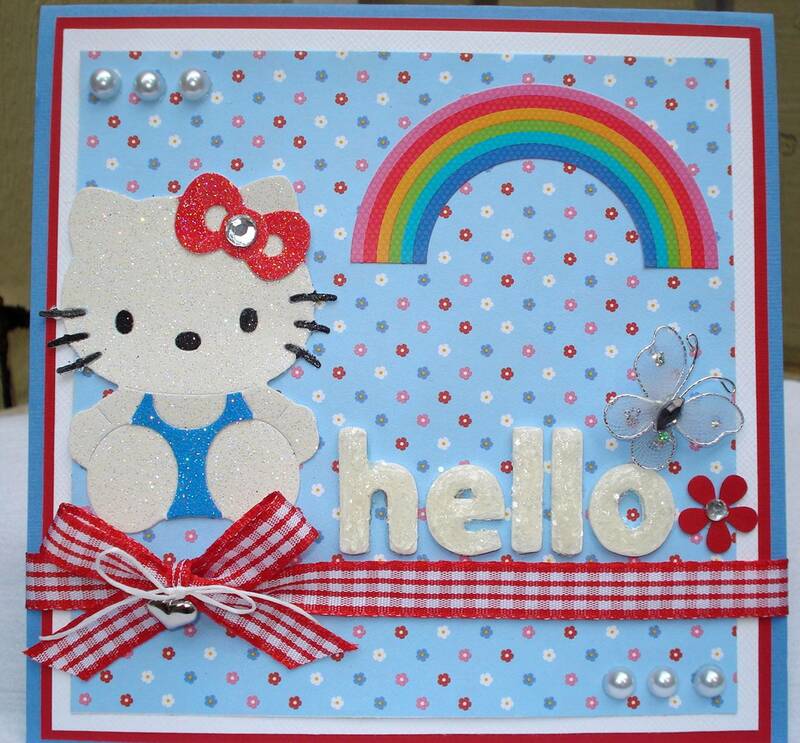 The rainbow sticker is from the Doodlebug Icons Sticker set. The butterfly sits on top of a pop dot. I absolutely love dimension, so I incorporate pop dots a lot in my projects. The little red daisy was cut from a punch. Again, I included some bling here. 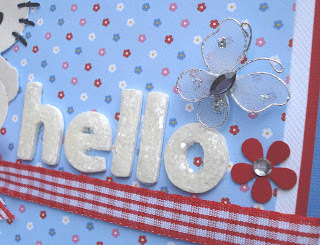 The "hello" sentiment was made using another one of my favorite products by one of my favorite companies: Maya Road. I love using blank chipboard pieces because I can paint or cover them with pp to match my project or get them to be the exact color I want. Although, it can be tedious, one of my favorite techniques is utilizing my Making Memories acrylic paints to paint the chipboard in the color I need at the moment. I like to then follow up with glitter and Glossy Accents. Here, I used white paint and then covered with glitter from a Martha Stewart collection. The glitter was sealed with Glossy Accents. 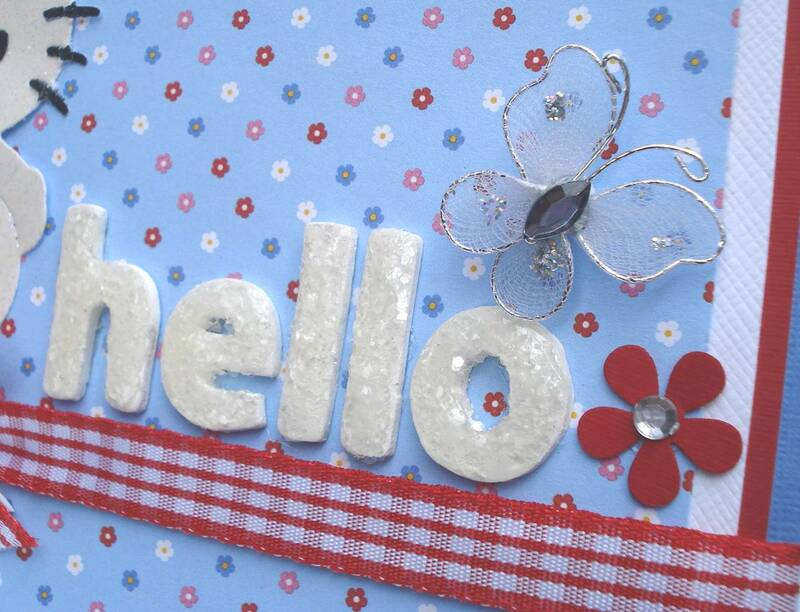 I adore gingham ribbon, and I thought some red gingham would go perfect with the feel of this card. 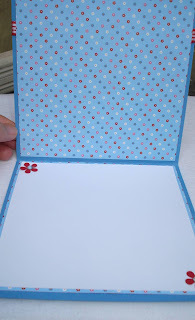 I included a little heart charm tied on with Scrapper's Floss and then finished the front of the card with pearls by Kaiser Craft. The inside of the card has been lined with the same pp by Reminisce. I included more of the punched daisies with bling on a white liner provided for writing purposes. I hope my partner likes her card! What a beautiful card with so many wonderful embellishments and details!! TFS! Love this card! Thank you so much- you put so much time and effort into it. Hope you got my card.